The last week has been a bit of a whirlwind around here. I've been all over the place in the last few days - so far my summer has been packed! On top of that Nate and I are planning a trip out to Colorado at the beginning of next month. I am so excited, we are going to camp and explore various national parks. Nate is going to be shooting some footage for his thesis project, and I'm going to bring my oil and watercolor paints along. Hopefully some good will come of it! Amidst all of our traveling and projects, I got the urge to make something decadent and homemade. My mom had given me a ton of rhubarb the last time I saw her, so I knew exactly what to do! 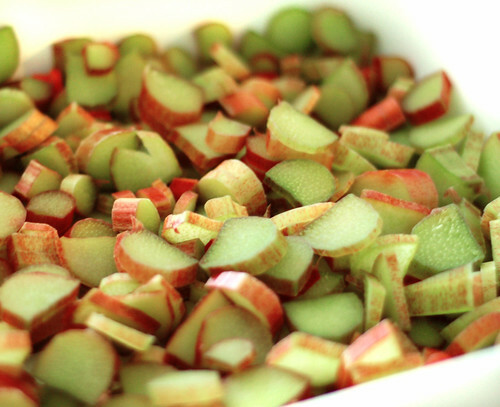 Chop the rhubarb into thin slices and put in a 9x9" or 9x13" baking dish. 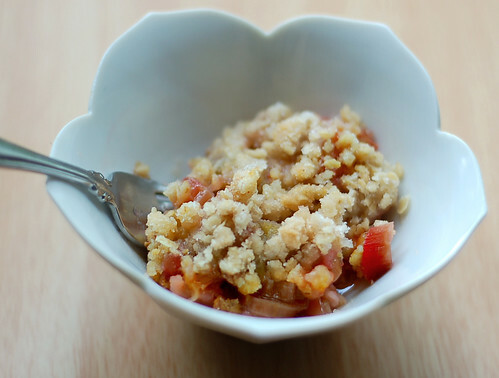 Add the 1/2 cup of regular sugar, and mix it around with your hands until rhubarb is evenly coated. Stop for a moment and admire the pretty pink and green rhubarb. In a separate bowl prepare the topping. Soften the butter ( you don't want it too hot, just melted enough so you can mix it in easily) and add in the butter, oats, brown sugar, flour, ginger, cinnamon, and vanilla extract. Mix with your fork (or your hands- as I like to do!) until the topping is clumpy and crumbly. Spread topping evenly over the cut up rhubarb. Pop it in the oven at 375 degrees for 35 minutes until topping starts to brown and the rhubarb is bubbling. Enjoy! I like to eat it hot with some ice cream over the top of it! Yummy! I love the bowl you served it in too. Oh my - not only does that look yummy - but you've made me homesick for the midwest with that scrumptious looking dessert. The tulip dishes nearly put me over the edge. Both remind me of my Mom. 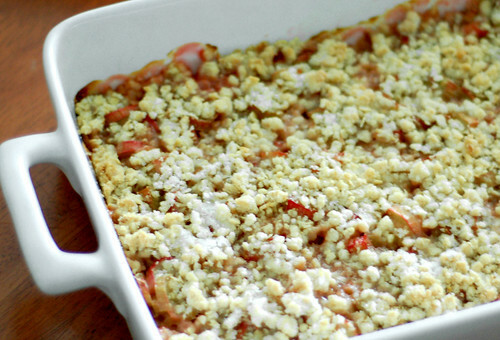 I tried your rhubarb crisp and it came out REALLY good! My family enjoyed it with ice cream as well. Thanks for the recipe. It's been very cool here in Michigan for being summer and I wanted something warm. Anonymous -- I'm so glad you liked the recipe!